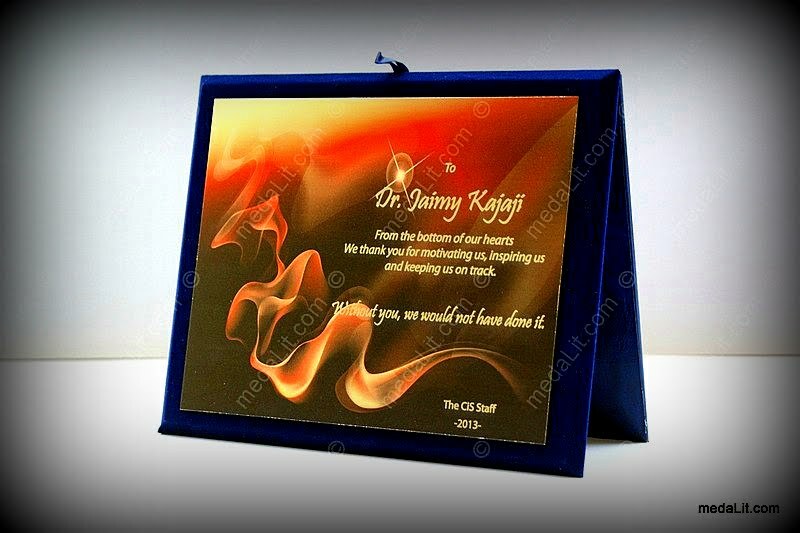 Satin-finished budget printed brass plaques are printed on 0.6 mm brass sheets utilizing high quality digital printing. Choose from more than 70 different templates and personalize it with your logo and text, or send your own layout and design. Printed on 0.6 mm brass sheets. The plaque face is satin finished. A thin layer of lacquer is applied. Wooden-velvet stand in a carton box included. Packed in a carton box. H is the box height. The plate is 30 mm smaller than the box size in width and also in length. Wt is the weight in gram including the plaque and the external carton box. Medals are incorporated within the design and printed. Extra medals can be included but will cost you extra charge. Any logo or message can be printed in dull color. The plaques are mounted on a wooden stand covered with velvet. Packed in a carton box. Velvet color is dark blue.